Hopefully, you have never had to deal with a bed bug infestation in your home or business. 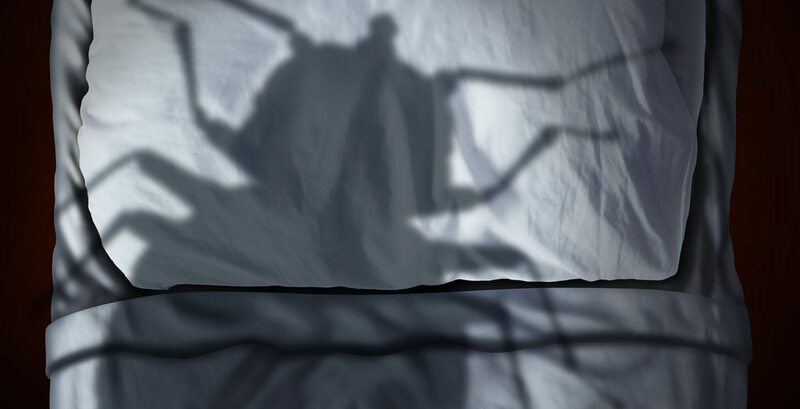 While bed bugs are not known to transmit disease, like mosquitoes and rodents – the mental anguish, stress, and frustration in dealing with the difficult to eradicate bed bug, can create a tremendous emotional and physical toll. Not only are bed bugs difficult to spot, and can very easily be transported undetected; they are also very hardy and can survive extreme temperature ranges. Which is why, if you do think you are dealing with a bed bug infestation, it is best to leave it to the professionals. A professional is trained to inspect for bed bug activity, and they have access to specialized equipment, such as bed bug sniffing dogs and heat treatment equipment. Furthermore, they have the training and expertise to manage even the most difficult infestation. In truth, however, complete elimination of an infestation could take several weeks to accomplish, even in the hands of the pros. Bed bugs can be very elusive and smart. They will adjust their feeding patterns to match your personal routine or sleep habits. Plus, they like to hide in cracks and crevices such as in mattress seams, bed frames, nightstands, shades, baseboards, sofas, clothing, luggage, backpacks, and virtually anywhere people live and congregate and rest for periods of time. Bed bugs prefer human hosts, regardless of social status or cleanliness. They are often found wherever people frequently converge, such as apartments, hotels, schools, healthcare facilities, public transportation, movie theaters or any other public venue. Watch to learn how to inspect for bed bugs. While cleanliness will not make you immune to a bed bug infestation, clutter can provide a lot more hiding places for bed bugs; which then can make it harder to treat. Therefore, cleaning up the clutter is suggested as part of an Integrated Pest Management (IPM) plan. However, it is a myth that you need to throw away belongings that are infested. Most items can be cleaned and treated. Frankly, throwing stuff out can be expensive and may even spread the bed bugs elsewhere. One safe and very effective treatment option is Thermal Remediation® or Heat Treatment. As mentioned earlier, bed bugs can withstand extreme temperatures. However, at 120º-140º F, it is lethal for all life-cycles of bed bugs. While this might sound like a do-it-yourself project, professionals have the proper training and equipment, such as heaters, fans, and heat monitoring systems to ensure all hiding places are properly and safely brought up to temperature. While heat treatment is very low-risk and effective, often times it is recommended that a follow-up chemical treatment plan is used in conjunction with heat, to ensure any hiding bed bugs are eliminated. The Modern solution to bed bugs. Modern Pest Services offers both conventional chemical bed bug removal and Thermal Remediation® or heat treatment (electric or propane) to its commercial and residential customers throughout New England. Modern is a leader in the pest solutions industry, and our trained Pest Management Professionals (PMPs) can customize bed bug treatment plans for bed bugs to meet your specific needs. Also, Modern offers canine inspection services, a faster, more reliable way to detect bed bugs. As soon as bed bugs are suspected, contact Modern Pest Services for a thorough inspection to determine the extent of the infestation. Then a treatment strategy and follow-up plan, including Integrated Pest Management (IPM) techniques, should be discussed.